For those of us with school-aged kids or who work in education, the new year starts about now – when our kids go back to school. You don’t need to make a resolution to make your life easier. When you opt out of prescreened mail, you stop a major source of paper clutter before permission slips, worksheets, art work, and other paper starts being sent home from school. Next week, we’ll talk about fall decluttering, but before you begin working on getting clutter out of the house, keep more clutter from coming in. 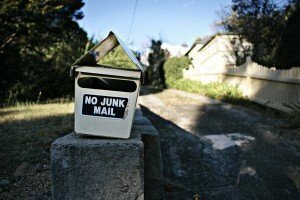 Start with mail: snail mail, email, junk mail, magazines, and catalogs. Cancel magazine and newspaper subscriptions you don’t actually read. Call the 800 number on the back of your catalogs and ask to be removed from the mailing list. Unsubscribe from emails (or lessen the frequency of mailings). Listserves and mailing lists — Set them to web only or unsubscribe altogether. Notifications from social networks — Do you really need an email every time a new friend joins Pinterest or tags you on Facebook? If you want to get really serious, you can try Inbox to Zero. For a start, just opt out. If opting out will not take care of your clutter problem, I can help. Call 512-591-8129 or contact me by email to let me know what you need.